One of the most beautiful books you will ever pick up, this story is by turns funny, moving and joyful. 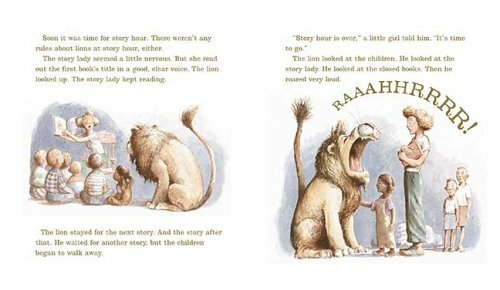 It describes the unlikely relationship between a stern but dedicated librarian and the lion who unexpectedly turns up for storytime. Miss Merriweather runs the public library with a stentorian devotion to the rules. “No running!” she says, frequently, and “If you can’t be quiet, you’ll have to leave. Those are the rules!” One morning, a lion walks into the library. Apopleptic with horror, Mr McBee the assistant librarian runs to inform Miss Merriweather. “There’s a lion – in the library!” he announces. Upon establishing that he isn’t breaking any rules, Miss Merriweather tells him to leave the lion be. He comes to storytime, and thoroughly enjoys himself. Upon hearing the lion roar, Miss Merriweather marches down the corridor and informs him in no uncertain terms that he will not be allowed to return to the library unless he can be quiet. Chastened, the lion learns his lesson and from then on he is quiet. In fact, he becomes an important part of the library. He turns up early every day and licks stamps, tidies bookshelves, carries the children around and makes himself useful. From initial scepticism, people come to love the library lion and look forward to seeing him there. But then Miss Merriweather has an accident. The lion needs to alert the deeply suspicious Mr McBee, who has been looking for an opportunity to get rid of him since day one, and refuses to listen to him. Until he roars. As Mr McBee runs triumphantly to report his rule-breaking the lion hangs his head and leaves. Will he ever come back? “One evening, Mr McBee stopped at Miss Merriweather’s office as he was leaving the library. ‘Can I do anything for you before I go, Miss Merriweather?’ he asked her. This is a wonderful opportunity for children to talk about their understanding of the text beyond the literal and obvious, and as such a real introduction to ‘proper’ reading. Its ending is a joyful celebration of friendship and acceptance. One to buy and cherish. There is more about Library Lion on Michelle Knudsen’s website, along with just a few of the positive reviews it received at publication.